The Daily Kirby: Why it is impossible to get an accurate lifetime page count of Kirby's art. Why it is impossible to get an accurate lifetime page count of Kirby's art. 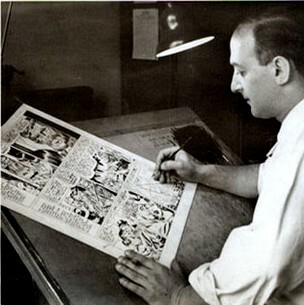 Mort Meskin working on a Crestwood studios page. Jack Kirby drew the top right panel and Meskin the bottom center one. Mort Meskin was one of the most influential comic artists of the 20th century. Meskin is the common influence on Steve Ditko and Joe Kubert's style. Mort's son Peter maintains the site that this photo is from: http://www.mortmeskin.net/ It has checklists, rare artwork, family photos and more.